Guidon Fat-Bar Harley-Davidson XL Big-Twin FL Softail FX Dyna Touring Custom Fat Arrow Highway-Hawk Fat-Bar 32 mm Custom Chrome. - Guidon Fat-Bar Fat Arrow (32 mm/25 mm) Custom Chrome pour Harley-Davidson FXSTC Softail Custom 2007-up. - Guidon Fat-Bar Fat Arrow (32 mm/25 mm) Custom Chrome pour Harley-Davidson XL 883 XL 1200 Sportster 20014-up. - Diamètre du Fat Arrow : "Fat-Bar" 32 mm sauf cotés (pour vos Commodos) diamètre 1" (25,4 mm) : Guidon Chromé pour Harley-Davidson avec Poignées et Commodos en 1" (25,4 mm). Pur Esprit Custom. 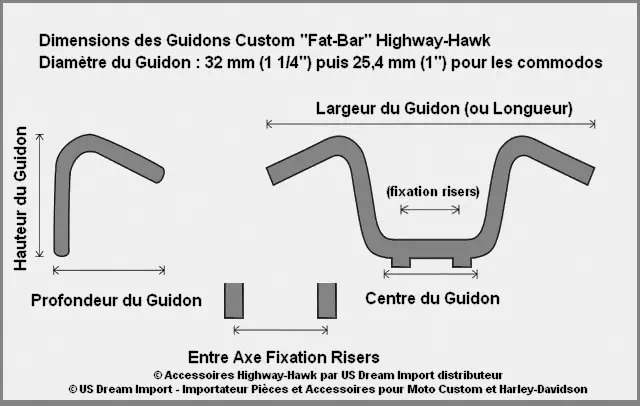 Guidon Fat-Bar (Grosse Barre de 32 mm) pour Harley-Davidson XL Big-Twin FL Softail FX Dyna Touring Custom Fat Arrow Highway-Hawk Fat-Bar 102 cm Custom Chrome.